Russia's Ground Forces will start taking delivery of new Tornado-G multiple rocket launching systems (MRLS), replacing the current Grad systems, Army spokesman Lt. Col. Sergei Vlasov said on Monday. This will further increase the Army's firepower and standoff capability for effective engagement, Vlasov said. Tornados are superior to Grads in their effectiveness, automated control, aiming and satellite navigation systems, Vlasov said, without disclosing any technical details. The Grad truck-mounted system featuring 122-mm rockets with a range of 30-40 km was developed in 1962 and has been in service since 1964. A Tornado MRLS vehicle can carry up to twelve 300-mm rockets with an effective range of up to 90 kilometers. 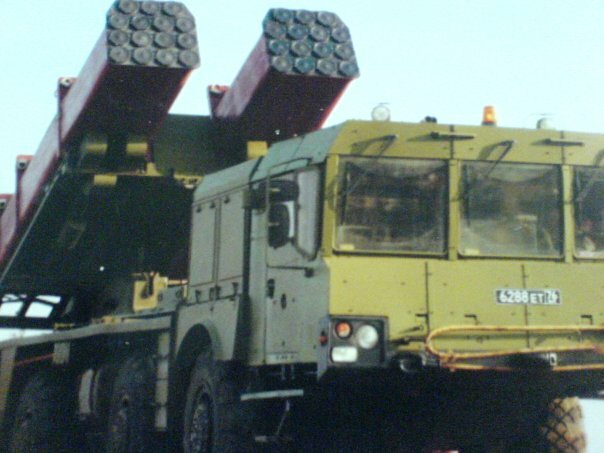 I was under the impression that the new Tornado was a standard truck that was able to take pallet based launcher pods and it could be fitted with launch pods containing 122mm, 220mm, and 300mm rockets from the Grad, Uragan, and Smerch family of rockets depending on the targets being engaged and the terrain being operated in. For instance for a light brigade you could issue 122mm pods to make the vehicle weight lighter and reduce the problems of reloading. For 300mm rockets you obviously need a support vehicle for the 800kg plus rockets to be loaded. The medium brigades could use the 220mm and the heavy brigades the 300mm. By combining the rocket types to one basic vehicle it makes it easier to mix and match so all brigades have Tornado rocket launchers and the needs of the artillery battery can determine what rockets are issued. ...they wont be able to send the wrong rockets to the battery... except if they send TOS rockets of course. In 2011, for equipping Army units will be procured new multiple launch rocket systems "Tornado-G", which should replace the system "Grad". A lighter cheaper vehicle than Smerch, but it is modular and can carry already loaded pallets of rockets in the 122mm, 220mm, and 300mm calibre range. Would expect as this vehicle will replace the Grad, it may also replace the Uragan... which is amusing... a Tornado replacing a Hurricane (Uragan). I think the Smerch will soldier on, because despite its weight it does the job. I rather doubt they will look at a tracked version as it wouldn't offer any advantage in firepower, but would be more expensive to buy and operate. They might make it modular too, but with more pallets to carry more rockets. Nothin wrong with eye candy. This is a small light truck that is much cheaper to operate and maintain than the huge truck used with Smerch. The difference in price of a small truck and a large truck is significant... several million dollars difference. Operational costs are quite different too. I have looked wiki & it says tornado uses 2 while Smerch uses 3 crew members; so if we have say 6 soldiers we got two operational/independent Smerch units while 3 Tornado units with the same qualities...Good work. I think the main focus is to develop a replacement for Grad and also Uragan with a light relatively cheap but also mobile truck system that can be bought in significant numbers without costing too much. With the ability to fire 3 different calibre rockets with all rocket types available as options these vehicles will be flexible and able to operate with most light units. I rather suspect the reduction in crew size would also apply to the new versions of smerch, though looking at the two different vehicles in my first post above the first vehicle is Tornado and has one pallet of rockets (6 x 300mm rockets), while the second vehicle looks like the same vehicle used with the Iskander and has two rocket pallets... which gives it the payload equivelent of Smerch. Perhaps these two vehicles will replace Grad, Uragan, and Smerch with cheaper lighter vehicles? Is the new launcher design for the Tornado-G meant to reduce its reloading time? or just to make it cheaper? I haven't seen the advertising, but in the current structure the Grad is the light, cheap numbers launcher that is mobile and good enough for most tasks. The Tornado seems to be a direct replacement for the Grad in that it is a modern light cheap vehicle. It will be more flexible and capable than Grad however because it can carry 122mm, 220mm, or 300mm rocket pallets that are preloaded so reloading should only take a few minutes compared with hand loading 40 rockets that would take longer. It can clearly carry a single pallet with 6 x 300mm rockets but the size and shape of 122mm rocket pallets or 220mm rocket pallets is unknown. 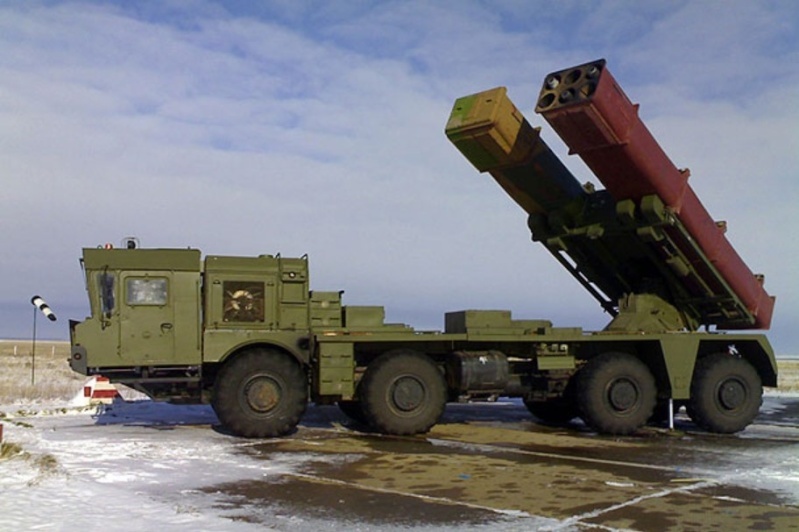 The larger vehicle based on the truck used for the Iskander/Tender system can carry two pallets so that means it matches the Smerch vehicles performance of 12 x 300mm rockets but I'd assume it could also be used to fire 122mm rockets and 220mm rockets too. I now rather suspect that Tornado is actually a two vehicle system, with the small truck shown above able to carry one pallet of rockets, and a second truck based on the same MZKT transporter for the Iskander TBM system that can operate with two pallets of rockets. I rather suspect these two vehicles will replace the Grad (122mm), Uragan (220mm), and Smerch (300mm) vehicles. The advantages of such a change would be that the MZKT chassis would offer commonality with the Iskander vehicle, while the smaller lighter cheaper chassis model can be used where the heavier model cannot. Both vehicles use the same rocket pallets, though the lighter vehicle carries one and the heavier vehicle carries two. The Rocket pallets come in three versions, a 6 tube 300mm rocket pallet, a 15 tube 122mm pallet I have seen and I presume there will be an 8 tube 220mm rocket pallet. This will mean the light vehicle can be equipped with 15 x 122mm rockets, or 8 x 220mm rockets, or 6 x 300mm rockets, while the larger MZKT vehicle can carry 30 x 122mm rockets, 16 x 220mm rockets, or 12 x 300mm rockets. I would presume however that mixed pallets could be possible on the MZKT so 6 x 300mm rockets and 15 x 122mm rockets could be an option, but of course different pallet elevations would be needed if you want all the rockets to hit the same target. This new arrangement means rockets are loaded as preloaded pallets which greatly speeds up reloading time and the mobility of the unit. Any rocket pallet type can be used by any rocket battery, so there wont be an issue with 122mm rockets arriving at a 220mm calibre rocket battery. The light vehicle will enable rocket artillery in places the heavier vehicle cannot operate, and its low cost will be good for export and mass production. (presumably the system can be applied to foreign vehicles, so might gain the interest of countries like Germany and France for which the US MLRS with its Bradley chassis is not so ideal... though there is the option of Himars). But I suspect they wanted balanced weights so they could load different rocket pallets on the MZKT without balance problems so 6x300mm=8x220mm=15x122mm in terms of weight I suspect. With modern rockets and new electronics I suspect these new vehicles will need far fewer rockets to achieve their mission anyway. Ground forces armed with 30 jet systems "Tornado-G"
Land Forces of Russia in 2011 had adopted more than 30 multiple launch rocket systems "Tornado-G." On this, as reported by ITAR-TASS , spokesman Army Lt. Col. Sergei Vlasov. 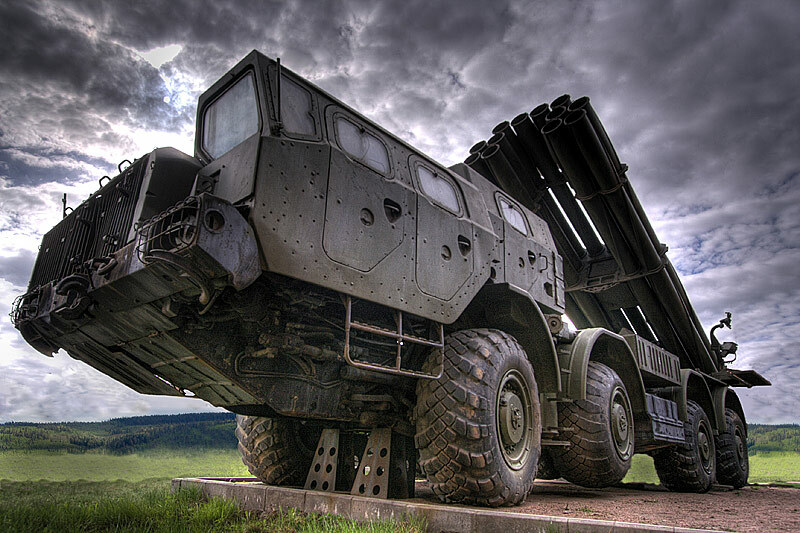 Earlier it was reported that the new system should be replaced in service with Russia outdated MLRS "Grad". "These are the modernized version of MLRS system" Grad ". They are much better their predecessors by increasing the firing range, power, ammo, and the introduction of automated guidance systems, targeting, survey and navigation, which allows MLRS units 'Tornado-G' to act completely autonomously on the battlefield, "- said Vlasov. "Tornado-G", established under the ammunition caliber 122 mm, designed to destroy and suppress manpower, armored vehicles, artillery and mortar batteries and command posts of the enemy. On the new MRL, little is known so far. Earlier it was reported that the system of "Tornado" will be released in three versions - T, U and C. These units will be equipped with triggering modules for ammunition caliber 122, 220 and 300 mm respectively. In addition MLRS "Tornado-G," said Vlasov Army in 2011 received more than ten thousand armored vehicles and automotive equipment, as well as about two thousand vehicles of communication. In particular, the forces of radiation, chemical and biological defense system were severely flamethrower CBT-1A and reconnaissance vehicles RHM-6. In engineering units have been assigned new tug-boats and motor truck cranes. "In the interest of the Army in 2011, more than 30 research and development activities to develop advanced models of weapons, vehicles and equipment," - said Vlasov. This article is interesting in that it seems to have a few errors. It mentions the Tornado is entering service, but seems to be a little confused regarding the Tornado-G which is certainly a replacement for the Grad, but in all the photos I have seen (including photos above) the Tornado G has been fitted with a single 6 tube pallet with 300mm rockets, while the article seems to assume it will be 122mm like the grad it is replacing. Further it suggests that there will be three versions of Tornado in 122mm calibre, 220mm calibre and 300mm calibre, yet as I mention above I have only ever seen two Tornado vehicles... one based on a light truck with one pallet, and one based on the MZKT vehicle also used by the Iskander system that has two pallets. I have only seen photos of the Tornado G with a single 6 tube 300mm rocket pallet, though I have seen the larger MZKT vehicle with 15 round 122mm rocket pallets (2), and 300mm 6 tube rocket pallets (2). If the pallets are modular then it makes little sense to have three vehicles but having 2 vehicles... one large and carrying two pallets, and one small and light and cheaper carrying one pallet makes a lot of sense in terms of flexibility and costs and performance. I could be that the Tornado system uses none of the MZKT or Kamaz vehicles pictured above. The photos are just trial and test units to test the rockets/pallets plus loading/offloading etc. The 1 pallet (6 x 300mm) Kamaz vehicle is certainly not the Tornado. That is a cheaper alternative for Smerch for export customers. As the article mentions, the Tornado-G is proably just one vehicle which can handle all 3 calibers (122, 220 and 300mm). Most likely candidates for vehicles are the variants of MZKT and BZKT. Could Tornado launching vehicle use different rocket pallets or only dedicated ones like Tornado-G only 122 mm, Tornado-S only 300 mm? It would be smart, that one launcher could use all three types of rockets and could choose the proper type of rockets considering battlefield situation. You raise a good point, in fact the vehicles shown could also be for export... perhaps Tornado G is just a concept that can be based on any local truck chassis. The thing is that the article above talks about three Tornados... T, U, and C.
The article from the original post of the thread and even this article that mentions the three (t,u,c) versions clearly states the version entering service is the g model to replace the grad. I have seen photos of only two models that have been called Tornado with the small truck and the MZKT being the two trucks, which I really do think are for Russian service. Remember the Grad is based on a similar light truck, so this model of Tornado (g) might be to make it as cheap to buy and operate, but with a performance upgrade of course being a newer vehicle. I have only ever seen the g model tornado with the 300mm 6 tube pallet, but as I have seen that same 6 tube 300mm pallet on the MZKT vehicle (two pallets), and also a 15 tube 122mm rocket pallet, also mounted on the MZKT, I think it is fair to assume both chassis should be able to use any rocket pallet. I have not seen any 220mm pallets, but as they are talking about three vehicles I think what they really mean is that the two known trucks... lets call them Tornado-G and Tornado-SU, because I think the light truck is a replacement for the old Grad and the MZKT will be able to carry pallets with 300mm or 220mm rockets and therefore directly replace both Uragan and Smerch in service. Two vehicles replacing three, with one of the two vehicles already used for the Iskander/Klub system so it is streamlining their artillery units vehicles while maintaining the firepower and flexibility. I assume the 220mm rocket pallet... which I have not seen photos of, will carry 8 rockets per pallet, so that the MZKT vehicle with two pallets can match the firepower of the original vehicles it is replacing... Smerch had 12 rocket tubes and Uragan had 16 tubes. The show it was presented at (and photographed at) described it as Tornado-G as a replacement for Grad. It will almost certainly be for export for countries that want Smerch but can't afford it. But that is the problem. If the pallets are interchangable then the only point to having three vehicles is if the first vehicle (g) can carry one pallet, the second vehicle (u?) can carry two pallets, and the third vehicle can carry more than two pallets. Well the article suggests Tornado G has 122mm rockets but the photos above show what is labelled a Tornado G with a single 300mm 6 tube pallet... which of course would make it faster loading and more flexible. In flat open country then a MZKT model with two pallets per vehicle would be ideal, but in rough county with bad roads the smaller lighter G model would be better I think. Tornado-S only 300 mm? It would be smart, that one launcher could use all three types of rockets and could choose the proper type of rockets considering battlefield situation. I totally agree. The different rocket types have quite different capabilities... and costs. When targets are 40km away you could choose to use any of the three types, but targets at 70-80km away then you need the 300mm rockets. It makes them more flexible. Th fact that the MZKT truck above is seen with 122mm rocket pods and 300mm rocket pods suggests it can at least use those two and likely 220mm rocket pallets too. Have only ever seen the G model with 300mm rockets. And further, the loaded pallet idea has been adopted at sea as well, so landing ships tasked with preparatory coast bombardment can now use 122mm rocket pallets with a rapid reload capability... I would assume that with the new Mistral class vessels operating 100km or more off shore that the 300mm rockets that might get flight ranges of 120-150km in the near future would be ideal to support such landing operations. Very strange... that just looks like a standard upgraded BM-21 Grad as shown in the early 2000s. I suspect this might be a direct replacement/upgrade for existing users who are happy with the existing system and don't want to upgrade to a different calibre. Pallet systems require new reloading vehicles able to swap out empty pallets with full pallets in 2-3 minutes, whereas this system you can get a group of men to hand load the tubes in 20-30 minutes. The pallet system would mean a choice of three different rocket calibres and dozens of rocket payload types. Strange indeed, that looks nothing like the unified chassis we saw with the 122mm packs. Perhaps this is an upgrade version for existing users that don't want to buy new TELs and support vehicles. It will have all the electronics and upgrades and new rocket options, but not the new pallet options. For new users there is the light (one pallet system above) and the heavy (two pallets above) replacement vehicles. As I have mentioned in my discussions with Ironsightsniper the old BM-21 still does the job and the way the Russians have trained reloading is not a problem because standard procedure is to shoot and then scoot to a new location where there is plenty of time to reload while you re lay the vehicles, check coordinates and of course wait for calls for a new attack. The MLRS might fire one or two rockets at a target... using rockets for their range. The Russians also use rockets for range and for their ability to deliver large amounts of HE or other munitions rapidly against area targets. For targets that require precision there is Iskander at the long range end and 152mm tube artillery closer in. The Russians didn't replace tube artillery with Rocket artillery.... they use both together. 1) A satellite antenna mounted on the roof of the truck's cabin. 2) A shell corrector (similar to the one on Smerch) on each tube that improves accuracy. 3) Some sort of a box underneath the launcher tubes that may be related to a remote control system. The optical device for aiming may be different tooo, but I can't confirm until I sea close ups. BTW, the newer 122mm Grad rockets have a range upto 40 km. That in itself is a great improvement. 3) Troops are already familiar with the system. 4) Some export customers may not afford to buy the larger MZKT based sytem. 5) There may not be enough capacity to produce enough MZKT trucks to equip every brigade with MZKT based MLRS systems as well as for Iskanders, BAL-E coastal defense sytems, SAM systems etc. 6) Ural based Tornado-G is more than enough for the needs of artillery units at brigade level. The larger MLRS sytems with replaceable pallets will be for specialized artllery brigades at higher levels. Note that this is the Tornado-G, there are also the Tornado-U and -S models that are supposed to be introduced. These will obviously need the larger MZKT or BAZ trucks to carry the heavier Uragan and Smerch rockets in quickly replaceable pallets. Whether they will be used also to fire the 122mm Grad missile as well is another question. Edit: Artillery responsiblity at the brigade level rarely extends beyond 20 km. Larger MLRS rockets (like Smerch) have a minimum range of something like 20 km. They are of little use at brigade level. The good old Ural based Grad (now Tornado-G) is a proven system that will satisfy their needs. I believe the Tornado-U and -S models will equip artllery brigades that support the usual tank/motorized rifle brigades from further away or to deliver strikes at longer ranges. For a mission that involves a target less than 30km distant that is armoured the Grad is the best. The 2M217 122mm rocket with sensor fused submuntions carries 2 munitions out to 30km. The 9N152 300mm rocket carries 5 submunitions. With 12 tubes the Smerch carries 30 munitions, admittedly to be used at up to 90km, while the 40 tube 122mm Grad can launch 80 munitions per vehicle. If you want to smother an armour staging area with guided submunitions then grad has its advantages. BTW having read your post TheArmenian I agree that this is a good idea that makes a lot of sense. Artillery has always been a focus for the Russian and Soviet military but it has rarely been a flexible tool, more a sledgehammer where a not precisely known target has the number of rounds fired in its direction calculated using a mathematical model to a certain level of destruction and is then attacked. Now with sat nav for the launchers and rockets and UAVs giving targets in real time and other improvements that make artillery much more responsive and capable the Russian Army is going to be much more formidible. Is this Tornado-G / Grad new build one or is this modernized Grad? I rather suspect it is an upgrade, because if it is an all new vehicle then it would make more sense to take the opportunity of buying a new rocket system to also upgrade the trucks as well. The talk on the previous page of this thread is still largely valid because we have seen pallets for 122mm, and 300mm and we have heard about the 220mm pallets which suggests the large and the light trucks also shown can take any of the three pallet types (122mm, 220mm, and 300mm). Guided MLRS rocket for "Tornado"
November 18th, 2009 at the landfill site of the Federal State Unitary Enterprise "Machine Building Design Bureau" (Kolomna, Moscow Region) was showing the existing and future armaments and military equipment. The main part of the exhibition were posters and models. Among the participants' companies took their place exhibition FSUE "SSPE" Fusion "of the glorious city of gunsmiths - Tula. 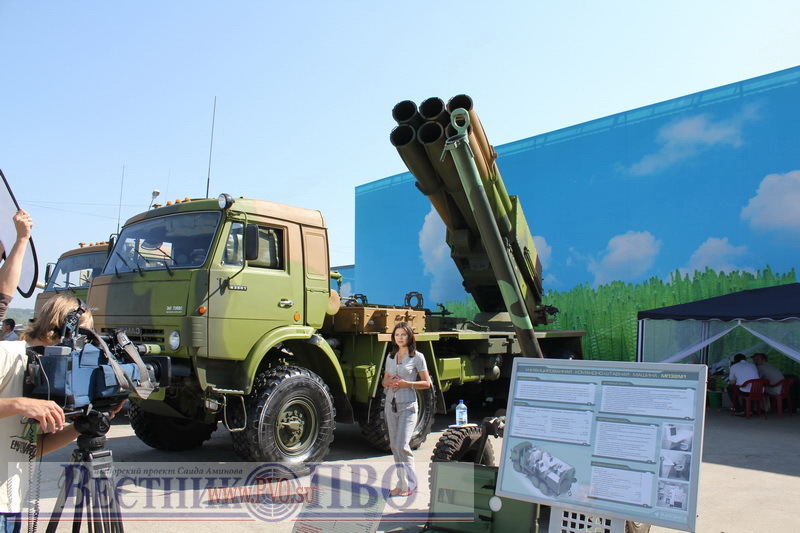 Feature was the demonstration of a new block of layout management system for the MLRS ammunition, "Tornado" and the layout homing combat element for the equipment of one of the many warheads known system. There is currently no official information about the performance characteristics of new models, but models and pictures, too, know how to speak.